Sony has gathered together almost 20 hours of documentary, performance, interview, spoken word, short illustrated lectures, and music-making featuring the Canadian pianist, Glenn Gould (1932-1982), as he appeared on CBC television (the Canadian Broadcasting Corporation) between 1954 and 1977. The ten DVDs are priced so reasonably (at not much over $10 each) that the collection represents a real bargain. It's something that listeners familiar with those broadcasts, those curious about Gould, and those willing to suspend, perhaps, awareness of the exaggerations and cult of the pianist in order to experience highly significant and compelling music-making will want to get. In other words you can come to this collection with multiple expectations; and not be disappointed. At the very least, younger listeners and viewers will get a feeling for the ways in which music was presented half a century or so ago… from the unpretentious podium unostentatiously occupied by Paul Sherman, to the now rather passé (though elegant and unselfconscious) style in which music was introduced in the mass media – static monochrome graphics wobbling on the rostrum and all. 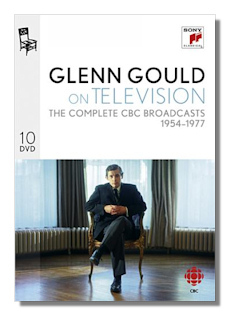 You also get an unusually rounded sense of Gould's immense musicality, his personality, sense of humor (he "plays" Sir Nigel Twitt-Thornthwaite, Dr. Karlheinz Klopweisser and Myron Chianti with bite but no malice at the end of the first DVD – trailers for CBC's programs), and above all his devotion to music and determination quietly to convey its potential to enhance, if not to change, life. The latter comes out in typical Gould fashion in his interview, "I hate audiences" [DVD 2]… his wit, articulation and brilliance are almost overwhelming. Particularly so when you remember Gould's preference for familiarity with the musical score over hours of practice at the keyboard. The many apparently off-the-cuff "lectures" which Gould delivers bespeak Gould's impressive musical knowledge, his confidence to drive through a theme (such as Strauss' position on the cusp of tonality and atonality and Bach's on the zenith of the fugue in DVD 3) to a simple yet strong conclusion is remarkable. Wit, humility, knowledge, communicativeness, experience, presence all jostle with a personality that still does not take itself too seriously. Very compelling. Somewhat different from Gould's playing, which tends to favor the slow and deliberative. But just as sincere. Almost the first thing that will strike you (especially if you're unfamiliar with Gould) is the breadth, the variety of his musical interests – from Marenzio and Lassus to Walton and Křenek. You probably would not have expected Gould to be proficient in the music of those last two, or for that matter to be at home in Mahler, Bartók, Hindemith, Copland or Poulenc or Shostakovich. Indeed, no fewer than 22 composers are represented on these ten excellently, if simply, produced DVDs. Then, almost as predicted, Gould's serene and perceptive musicality will work its magic on you. No matter how committed you are to period instruments for Bach (to whom, he famously avers on DVD 1, one should always listen – as opposed to never paying attention to the critics), Gould's touch, his sense of the inevitability of the musical development in, say, BWV 1052, the D minor concerto, is impeccable, inspirational. For all the formality of his performance (originally broadcast in 1957) the embrace between composer and musician is intangible; yet evident and productive (necessary almost) in a way that – perhaps ironically for our sensibilities over half a century later – defies the ego and ends up accentuating the music not the performance. After this comes the most informal of snippets: Gould playing (and singing, of course) the Sinfonia from the C minor Partita, BWV826 – at home, in what appears like a dressing gown with his dog watching on! But his modesty and almost adolescent enthusiasm for the piece's rhythms and the intricacy of its counterpoint are never anything but convincing. The speed at which he works contrasts with the previous piece indicating his total absorption in what matters most. What's more, listen to his talk on Bach on DVD 2 for as mature, authoritative and penetrating introduction as you can expect to the ethereal cantata, "Wiederstehe doch der Sünde" in which Gould also plays the piano. You look for genuineness, truth, somewhere, failing to find it in that instrumentation. But you do find it. Indeed, the alternation of events, performances, pace, composers, talks, humor – while broadly advancing through the years of Gould's remarkable career to just three years before the stroke from which he died at the age of 50 – adds to our excitement, our understanding both of his scope and command as a musician, and to our insight into Gould as a person. And a person as much as a personality. These DVDs, which acknowledge the cult that existed around Gould even when he was alive, and which has either interfered with or enhanced our appreciation of him since 1982, make no effort to explain, deflate or re-enforce it other than obliquely by presenting the raw material on which such a cult was built. Rather, Sony has a set of great value that allows us to listen to and watch Gould at work, drawing out both the nuanced inferences (in some ppp passages, for example) and exposing the inevitable – effortlessly, without fuss, seemingly as though the music, often, was written for Gould. Yet neglecting none of its intricacies or color, personality and power. Perhaps to offer some context, the DVDs are replete with the surrounding CBC introductions to the programs… announcements, logos, trails and a sense of studio. We get Gould in situ; and that's something to which he would surely not have objected. Were he alive now, he'd be making full use of the latest internet (audio) technology. We're tempted to sit back (to counteract Gould's hunched posture) and sigh, and to say quietly, "Yes, that's why Gould is so highly revered!" At the same time, the pianist's engagement with, and prioritizing of, the music itself advises us to see him – for all his huge presence – as a vehicle for the whole world of music. None of this is to say that the purpose of this set is not actively (even critically) to explore and assess the Gould legacy. But to do so less by passively treating it as a "phenomenon"; although certainly to let the "wonder" of – and at – Gould breathe. But above all, to present these treasured extant recordings and insights for what they are; and let us, the audience, broaden and deepen our experience. The set will have succeeded best if it allows us to form a balanced twenty-first century view of Gould's music-making that is also consistent with the norms (particularly in period practice) of the three decades from the 1950s to the 1970s during which Gould was working. And at the same time the collection works because it really does present a view that allows our understanding of what might well be called an over-romantic approach, particularly to Bach, to inform our acceptance of the universality and timeless appeal of the music which Gould performs. As hinted at, one way we can do this is by seeing the consistencies and contrasts which Gould articulates when performing what for most are the very greatest composers… Bach, Beethoven and Mozart. Yet at the same time finding delight and stimulus in Copland, Prokoviev, Webern and Marenzio for example. To that end the thematic approach taken in preparing these DVDs is hugely useful: The Subject is Beethoven, Music in the U.S.S.R., The Anatomy of the Fugue, Music In Our Time, The Artist as Artisan and so on. To that extent, this set is a collection and – given the medium – it can be dipped into. Apart from being so enamored of Gould's spontaneity and expertise that you work your way through all ten DVDs and 19 hours sequentially, one good way to approach the set is to identify these themes and explore them comparatively. Then to let Gould's blend between mercurial enthusiasm and consummate musical instinct take you where it will – like browsing, then reading, a dictionary! One highlight is the Idea of North film [DVD 8] which Gould made in collaboration with Judith Pearlman in 1970 and is otherwise not readily available – certainly not in this form. It's typical of Gould's approach to life, music – and to wisdom and understanding experience. This – and Gould's facility with character, the projection of himself and his musical self – do make us wonder what kind of career he would have had if he had not died so young. So – with the possible exception of the Bach and Beethoven – it's unlikely that you'll buy this set of DVDs to acquire specific, definitive performances of many of the composers and works which it contains. You'll use it to revisit the essence of an extraordinary musician, one who did indeed change the way we listen to Bach in particular. You'll use it because it represents a significant portfolio of Gould's legacy most of it previously unavailable. You'll use it because it goes back to the source: Gould's affirmation that live performance can tend to conservatism (the performer can only "recreate" the music from scratch each time). You'll use it to examine at close quarters Gould's prodigious technique – especially the clarity and independence of every single note, a by-product of his teacher, Alberto Guerrero's, development and advocacy of "finger-tapping", which only barely co-incidentally compensated for Gould's back injury as a child. You'll use these DVDs because, as Gould gave up public performances, they are valid and exceptional documents of a medium in which he felt more comfortable. You'll rejoice at the frankness and apposite approach to music which is revealed in British expert, Humphrey Burton's, two discussions with Gould. The quality of production is as you would expect – or better – given the age of the originals. Certainly high enough for more primitive means of recording not to intrude. Editing has been minimal. Certainly no unnecessary visual "effects". The booklet that comes with the set is full of clearly laid out detail, though contains, perhaps, less background that might be expected in a presentation of such importance. If you have any attraction to the world of Gould, in summary, you will not want to miss this excellent, illuminating, indeed inspiring, set of DVDs. Thoroughly recommended.